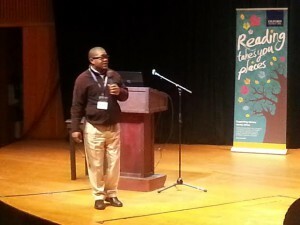 A former teacher presented at the 2015 Pan-African Literacy for All Conference on Wednesday about research that has helped more than 30,000 Zambian students to improve their literacy. The Quality Reading Materials project provided 55 schools in the Petuake and Kafue region of the country with local language storybooks, school library facilities, and teacher training. The project, which was developed by NGO Room to Read, was designed to share experiences in literacy to create enthusiastic, passionate, and independent reader that are more likely to complete secondary school. Goals for the programme were to improve children’s vocabulary, phonics, and comprehension in a low cost way that is informed by research and is relevant to children in the target districts. Following input from local experts, and informed by educational research, storybooks were developed in local languages with relevant content for students; teachers were provided with support; school libraries were developed; and specialist instruction was provided. An evaluation carried out as part of the project found that in some schools, fluency and comprehension had increased threefold compared to learners who had not taken part in the project.